Fair Trade is a global trade model and certification allows shoppers to quickly identify products that were produced in an ethical manner. For consumers, Fair Trade offers a powerful way to reduce poverty through their everyday shopping. For farmers and workers in developing countries, Fair Trade offers better prices, improved terms of trade, and the business skills necessary to produce high-quality products that can compete in the global marketplace. Through vibrant trade, farmers and workers can improve their lives and plan for their futures. Today, Fair Trade benefits more than 1.2 million farming families in 70 developing countries across Africa, Asia and Latin America. Globally, the Fair Trade network certifies coffee, tea and herbs, cocoa, fresh fruit and vegetables, sugar, beans and grains, flowers, nuts, oils and butters, honey and spices, wine and apparel, and certified ingredients are now used in ready-to-drink beverages, body care products and spirits. In the United States, Fair Trade Certified™ products are available in more than 50,000 retail locations. So, Fair Trade provides resources, education, and support for farmers and workers in Third World places, improving their communities and giving them a real chance in the marketplace. Plus, in my experience, some of it tastes better than the usual mass-produced stuff. Learn more at the link above. 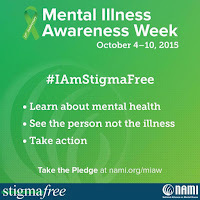 Each year Mental Illness Awareness Week occurs during the first full week of October. This year it takes place between October 4–10. This year, the theme revolves around building a movement through the new StigmaFree initiative. Being Stigma Free means learning about and educating others on mental illness, focusing on connecting with people to see each other as individuals and not a diagnosis, and most importantly, taking action on mental health issues and taking the StigmaFree pledge. 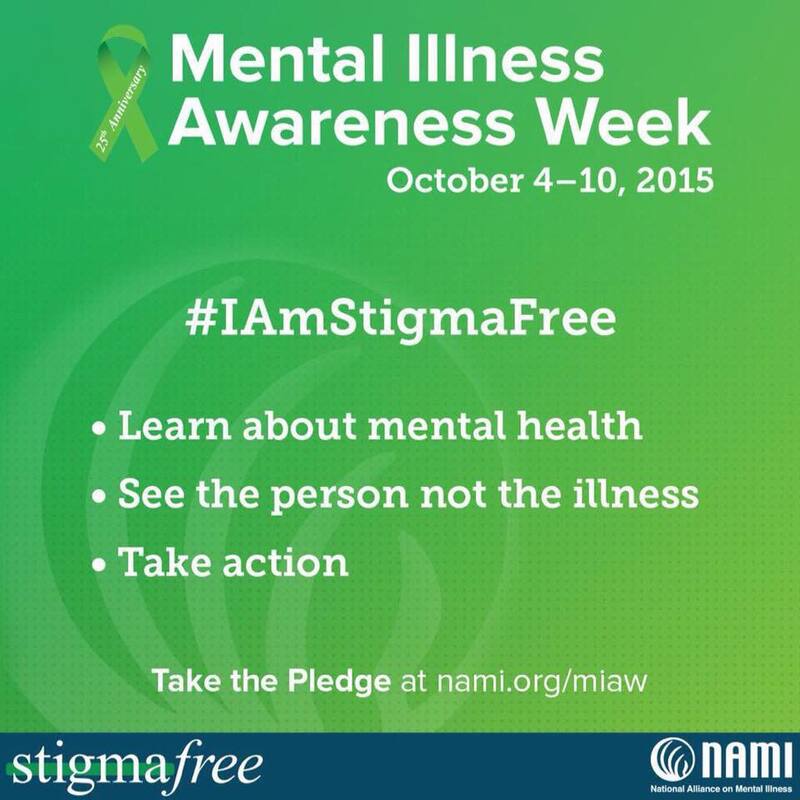 The hashtag for the theme is #IAmStigmaFree. Mental illness is the scapegoat of choice after a mass shooting, which does two things: 1) it piles onto the stigma, and 2) it serves as a cover-up for other possible causes. 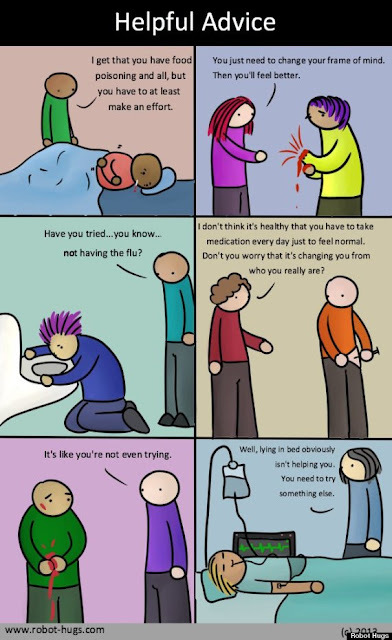 It is estimated that 25% of the population suffers from mental illness; it's better to understand what it is and seek resources for support, rather than react to it out of fear based on popular tropes. I highlight these because they're important to me. Give each a look, if you please. And I am Christian because following Jesus means being a Christian. It means hanging out with sinners and other people who struggle with the baggage. With people who want to hold on to the baggage at all costs, or people who have been trying to toss it from the bandwagon since before they can remember. Because believing in Jesus just doesn’t work outside of community. Because taking up our cross and following means we don’t get to avoid all the crosses in the world, but instead Jesus’ ministry happens right where the crosses are. The crosses of hypocrisy, judgmentalism, abuse, control and power. Dumping Christianity to follow Jesus doesn’t jive with the God who put our baggage on, who literally became our baggage, who used our baggage as his flesh in order to come and meet us in the incarnation. And of course our baggage, our flesh, made things much more difficult for Jesus, but that was the only way to reach us. Parker says some good things, I think, about remaining in community with fellow believers who will support, encourage, and edify. Where we sometimes get tripped up--"we" meaning people for whom the institutional church is still a place that works--is thinking of Christianity only in these ways. Many books and articles have tried to make the case that the church can still be a helpful place even for people who have been hurt or rejected by it, if only we make it cooler, more missional, more orthodox, etc. But Christian community will not always look like that, and following Jesus will not always look like that. And that's a good thing, because it avoids people trying to force others into something where they don't fit. I get and like his points. They just run the risk of still being too narrow. I hate to put the title track so low, but these are some of the worst rap verses of all time. Defend that in the comments if you wish. I can’t. TATTOOS AREN’T GREEN. I had Jesus Freak on constant rotation through the second half of the '90s. Any time I listen to it, a wave of nostalgia washes over me, most of it good though a few things not so much. As for the list, "Mind's Eye" being so high is ridiculous to me, especially over "Day By Day" and the title track. The critique of "Colored People" is well-taken, although I recall that the band's intention was to push back against the "I don't see color" mentality instead of endorse it. All in all, this post was a nice little walk through some old memories. Misc. Erik Parker again on reasons why it's great to be a church bully. Jamie on turning 40. I'm tucking that one away to re-read in just a few short years. Glennon Doyle Melton on being liked. Elsa Peters on having a sense of humor in the church. Allen O'Brien on believing in redemption until you don't.